Felicia's elegance sets her apart from any other catamarans available for charter. A 65ft long catamaran, she is incredibly spacious and she has been constructed and maintained to extremely high standards. Not only does she provide an ideal environment for groups of up to 8 adults but she is equally well suited to a large family group. Her guest accommodation comprises 1 King cabin and 3 Queen cabins each with their own en-suite facilities, a huge saloon which includes a bar, indoor dining table and a writing & games desk. The cabins and saloon are all air-conditioned and feature flatscreen TVs with DVD players for which a substantial library of films is available on board. The crew's quarters are accessed completely separately. The vast deck space includes sun-bathing mattresses, trampolines and two large stepped swim platforms. Each day your only priority will be to decide between sailing, swimming, snorkeling, waterskiing, wakeboarding etc. The pair of teak dining tables in the enormous cockpit provides the perfect base for al-fresco meals which are prepared and served by the professional and friendly crew. In keeping with our philosophy for Felicia, the crew was carefully selected for their professionalism delivered with true charm and integrity. Their infectious love of the yacht and the Caribbean Virgin Islands will add immeasurably to your stay aboard. The requirements of each group will always differ. Some charter groups will prefer a greater emphasis on watersports, others on secluded beaches and yet others on excursions ashore. Our constant theme, however, is that you will enjoy the freedom that no other holiday can match! Come join Felicia in the Virgin Islands for a luxury yachting vacation of a lifetime! Save 20% off the charter rates for 5 night or longer charters sailing the BVIs or down island as far as Grenada. New reservations only. Available now through 10 Aug 2019. Confirm before 19 Jul 2019. Arnaud was born in a little village east of France. He spent the holidays of his childhood on the Mediterranean Sea, learning to sail on Hobie cat and Laser. In his early career choice, Arnaud studied child development psychology. He worked in social centers with trouble kids. His love for children takes him to the tourism industry managing the kids club in Club Med. There, his passion for sailing took shape. To truly follow his dreams, he moved to the Caribbean island of Martinique in 2008. He sailed around the Caribbean as a professional skipper for 11 years. As freelance captain, he worked for several companies on different types and sizes of boats, chartering, delivering boats along the West Indies and across the Atlantic. Learning to speak English was one of his main goals too and being in the Caribbean working with local businesses he achieved that goal, now he’s fluent. Born further down in the south Island of Trinidad and Tobago, she moved to a country known for the friendly spirit of the people, St Vincent and the Grenadines. She grew up loving sea, where she fish with her brother. Upon completing High school, Vernice went to Canada to become a Personal Support worker, but realize that her passion was somewhere else. Before the Yachting industry, she worked at the Tobago Cays Marine Park, where she managed her own souvenir and gift stall. At the end of the day when her business closes, she worked as a cook alongside her mother who is a chef doing beach Barbeque lobsters. At a young age she learnt the use of Caribbean spices to bring out the best taste in any meal. Enjoying cooking and creating, Vernice learnt to infuse the Caribbean touch in recipes from different nationality. Besides cooking and eating, she love travelling, reading, fishing and modeling. She believes that the real beauty of life is Good food, Great friends, smiles and being comfortable. Contact us for rates and current availability or to book a charter aboard Felicia! 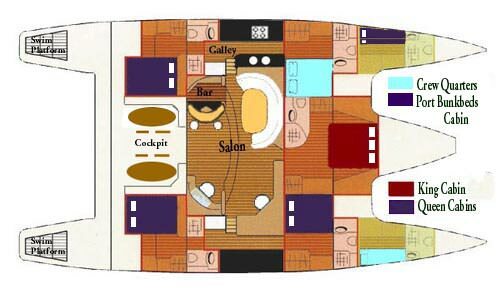 One center-line master cabin with walk-around king berth, en-suite head with electric toilet and stall shower. Three queen cabins, each with private en-suite head with electric toilet and stall shower. The crew cabin forward port with their own en-suite head. Felicia has a spacious main salon with a beautiful bar for happy hour as well as formal dining. Aft deck has two tables for alfresco dining and lounge area. Forward trampolines offer a vast lounge area. Absolutely excellent! Felicia is extremely comfortable. We liked the outside setting and "hang out" areas. The food was 5 stars all the way, Julie is a phenomenal chef. Couldn't have been any better, we wanted for nothing. Chris & Julie are absolutely first class! Simply divine food preparation and presentation. Julie has converted Felicia into a 5 star floating restaurant. Chris did a great job at helping us focus in on those sights and experiences we wanted to do most and worked out a perfect plan to be sure we enjoyed our time sailing and while in harbor. Sailing Directions provided excellent recommendations and guidance on the entire needs of a trip of this sort. The total experience was wonderful. Everything we needed for proper preparation in order for us to have a care free extremely relaxing vacation was provided by Sailing Directions and Yacht Felicia. What a wonderful experience spending those five days with you was. Everything and I do mean everything was perfect. Even the weather which provided a little drama was perfect. I have not stopped talking about the two of you. My dream is to do it again and to share the experience with all who might want to also experience such a wonderful vacation. Every time I view the video and read the words "We will miss you". I feel certain that you must know that you are missed and were so very deeply appreciated for all that you did. So many details that could be easily missed, you were on top of it.